Item Dimensions: W86.5" x D39.5" x H30"
We remodeled our dining room and "IN LOVE" with this Brianna table from Whiteline. Perfection! Outstanding quality. I was not expected such high quality and craftsmanship. My family is even impressed with the quality for the price. I would recommend this product. Love the quality of this table. Small hard to find size is perfect for our great room as a breakfast or card table. Very good value for the cost. The top is beautifully inlaid. Definitely a winner. 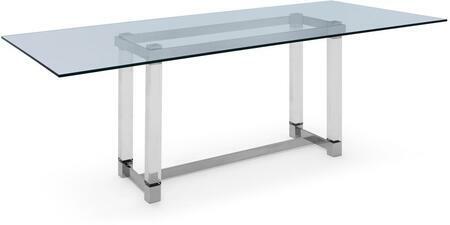 I ordered this table after several weeks of online research. It sets quiet well with my chairs that I ordered separate. Definitely impressed with the quality and appearance for being an online purchase.